Children very often dislike milk but as parents or elders, we struggle to find ways to get them to drink it up owing to the huge benefits that milk provides. 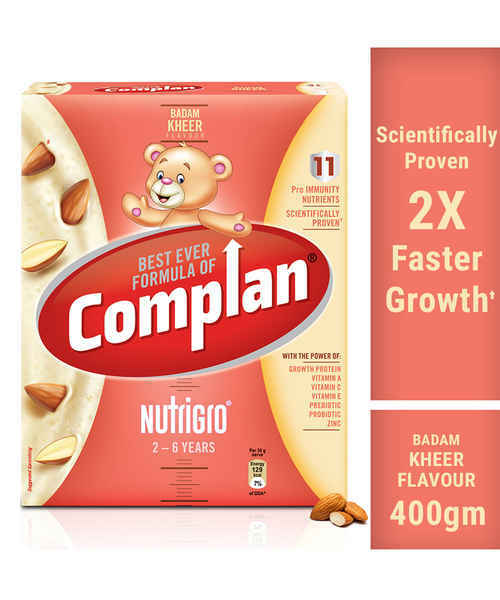 The tasty badam kheer flavour of the Complan Nutri Gro Badam Kheer health drink, is a boon which ensures that children drink their glass of milk everyday without causing any trouble- especially the picky kids. The Complan Nutri Gro Badam Kheer is a complete planned milk drink manufactured with 11 immunity builders and meant for children between 2-6 years of age. Though this age group gains the most benefit of the product, people of any age above 6 can consume this delicious, creamy drink! A comprehensive balanced nutrition provider, the Complan Nutri Gro Badam Kheer helps to fill in nutritional gaps in children's diets especially among those who are fussy eaters- thus maximizing the growth potential. It is made of 11 immunity builders are meant to supply DHA for the overall brain development and also enhances an improved memory. The easy to digest product will ensure that your kid does not suffer any kind of ill-effects. Being a vegetarian and non-alcoholic formula, this ready-to-use product can be mixed in both water and milk and consumed instantly. This is a refill packaging of 400gm quantity; comes with a shelf life of 15 months and can be consumed 2 times a day! The product is also further found in other two flavours- chocolate and yummy vanilla.